There’s a nice little sale going on at the Airfix online store. 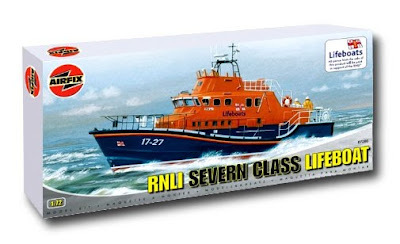 One of the best bargains is the 189-part 1:72 scale kit of a Severn-Class lifeboat. It’s the largest UK lifeboat type in the RNLI (Royal National Lifeboat Institution), a charity organization that has saved nearly 140,000 lives during its 185-year history. The kit forms a good partner with other Airfix shipping, such as the Vosper MTB, and would look absolutely terrific starring in a rescue diorama. The Severn scales out to 236 mm (9.3 in). Oops - as we write these details, the Severn seems to have gone out of stock, so you'd better be a bit sharpish with the other bargains down at Airfix. The one that looks good to us is a 1:72 scale Super Constellation propliner, one of the best-looking airliners ever made, and a model with a raft of conversion possibilities.